I have a new obsession oflate. I post atleast one quote on Instagram everyday. It somehow makes me feel good. Quotes are something that rule my life. Just like love. I am totally obsessed with quotes and I tend to annoy people by quoting some during serious discussions. But isn't that why quotes exist? Although most of the quotes I like are the sarcastic ones, my favorites remain the ones that I have read from some books. 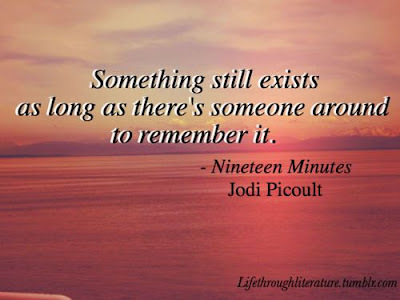 And the one book that has given me more than half of the quotes of my personal collection is Nineteen Minutes by Jodi Picoult. There are way too many to choose from, but this one is my favorite. Parul has nominated me for the 3-Day Quote Challenge and this is my first favorite. 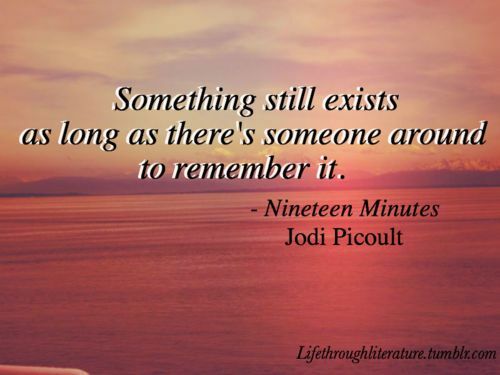 Nineteen Minutes is such a wonderful book that I shall re-read it as many times as I can. It talks about human emotions and psychology in a way that was never explored before. The journey of Peter Houghton and the bullying that he faces is something that I can never forget. This book troubled me a lot. I was upset for weeks after reading it for the first time. It had a lot of quotes and while reading the book for the second time I fell in love with every one of it. This quote is something that shall remain my favorite forever. I read this quote when I was going through a tough time personally as I was trying to get out of a broken relationship. This quote made so much sense to me that I decided to let go that instant. As long as you think that something exists, you will never be able to forget it. The main problem is that it exists only for you. If you believe that it is no longer around, it is more easier to forget it. And this need not be applied only in the cases of people or relationships. If you are trying to let go off something or a habit, you need to know that it no longer exists. If you think it exists then there is no way you can let go. The object of desire should be killed in the mind. You need to believe that it does not exist. And what does not exist cannot be remembered. You get it? Today I nominate veteran bloggers and my favorites Shailaja, Vidya and Shilpa to take up this challenge. Thank you Parul for nominating me for this wonderful challenge. I'm obsessed with quotes and this is the perfect challenge to showcase my collection. I have only known you recently through your blogs and I already feel like I know you for a long time. Your Instagram feed shows me what an awesome and lively person you are. And your blog title has "food" in it. That makes you my favorite already. That's a lovely quote! and I am going to pick up the book. Glad you took the challenge and so sweet of you write that nice intro! It made me smile :) :) Happy Weekend! Thank you Soumya. That's a fabulous quote and reading your post made me feel quite emotional. About the challenge, if I understand you right, I post on three consecutive days with quotes of my own - and nominate three bloggers on all three days? Or do I nominate 3 bloggers on the first day and then just post on day 2 and 3 while they carry on the chain? Must be the 'flu, because the lights in the top storey are dim and flickery. Yes, you post on three consecutive days and nominate three fresh bloggers each day. So nine bloggers will pick this challenge in total. I love quotes! I have always enjoyed your earlier quote collection posts. And I wonder how come I missed this book, nineteen minutes. It's the next book I am gonna read. its true everything exists in our mind and and we should control the only thing we have control over which is our own thoughts and emotions rather than control other people's thoughts and emotions with which we have no control. Nice quote Soumya. I will grab the book too. Quotes are something that I love to collect. I have a app installed on my phone, that gives me a new quote daily morning. Some days I feel so better and inspired when I could relate to them. That quote makes so much sense. And it can be applied in so many different situations, as you said. Thank you for sharing it!